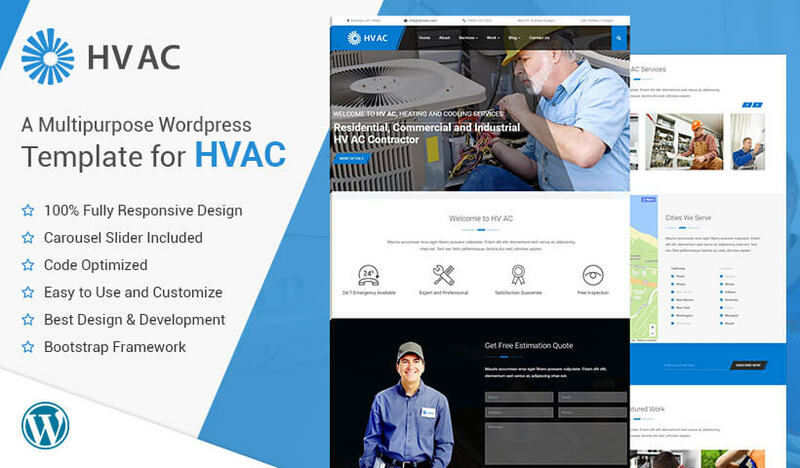 Download fully responsive Air conditioning WordPress Theme, HVAC WordPress theme for heating and cooling companies. This is one of the best agency WordPress themes that focuses on quality templates and excellent business themes. 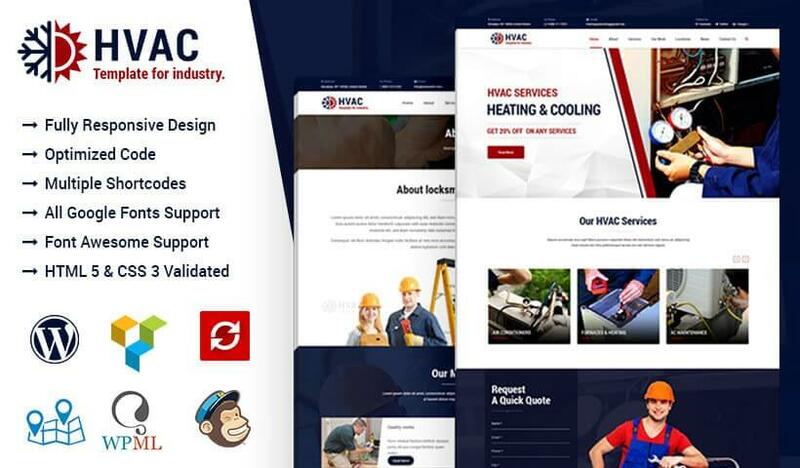 This website template is a premium theme especially designed for HVAC companies because heating and cooling dealers and experts need a nice and elegant looking website that can be modified using a WordPress theme. We created HVAC WordPress theme with the great features that a heating and cooling company needs to make a HVAC website. This air conditioning company website template offers unlimited color options. So, you can change the color or background images for your HVAC business website directly from the theme option by going into the admin section. Air conditioning WordPress website template and theme is designed SEO friendly. So you can expect your business website will be ranked by search engine very easily. This WordPress Agency Theme has a clean and stylish header. On the Left side you can add your company logo with your company description like email and phone number. You can customize the navigation of this theme every easily and edit menu name and add or remove new links. Animated and attractive slider make This HVAC WordPerss theme more elegant. You can easily customize your slider content, links and images related to your business. This is very cool option for this theme that you have very prominent lead generation form on the above fold. Form is a very vital part of the website to generate leads. This page has a lead generated form on first slider of slider. You can easily convert your visitors into leads with this form. Its design is very clean and elegant. This section divided 4 animation boxes with relevant icon and short text about support, expert and professional, guarantee and free inspection. You can display you different air conditioning services that makes your heating and cooling website template more user friendly to your visitors. Its stylish carousal and you can your services with easy approach. Its fully customized carousal you can change your own images, text and links. This landing page has an offer section where you can show your latest offers with description. You can easily change this text with admin panel. Skills section of this page contain animated skill progress bars and you can show your progress and easy to customized with admin panel. Can this theme be used for handyman services? Yes, this WordPress theme is convertible for different businesses and industries like, handyman services, hvac, heating and cooling. Is it a an Agency WordPress Theme? We definitely call it an Agency WordPress Theme that works better for your agency. So, Yes! you can download this website theme as an Agency WordPress Theme. Not only is this one righteous theme, but it comes with great customer support. The theme is very easy to modify and I am confident that after I am done building this site for my client they will be able to handle content changes themselves. Good job. All about this theme it’s perfect, documentation, code, support and everything else. I had a few problems with the theme but the support is very helpfull and they change very quick things on youre website.